If you're in the market for a new high-performance luxury BMW, look no further than BMW of Sarasota. We proudly serve Bradenton, Port Charlotte, Lakeland and the surrounding areas. 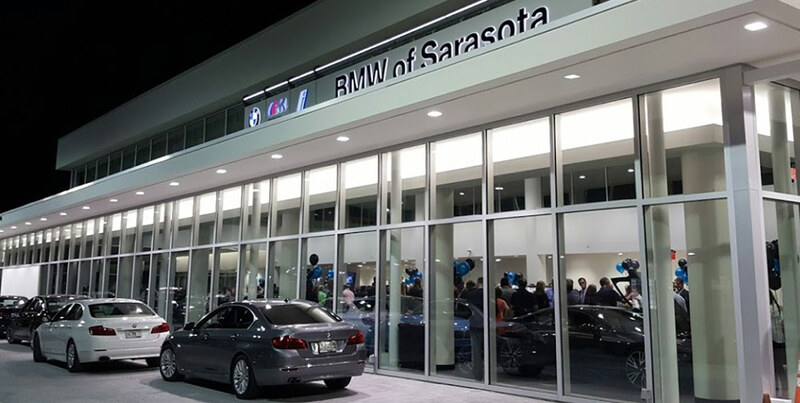 Our luxury BMW Sarasota car dealership offers the latest BMW model lineup at our lowest prices available every day so you'll never have to wait for a sale to save. BMW of Sarasota will even send you price alerts when the model you're interested in is reduced. Plus, every BMW we sell comes backed by the BMW of Sarasota Difference – a benefits package designed to make the most out of your new investment. Visit us today and let our friendly and experienced customer service representatives help you find the perfect BMW at the perfect price. With an extensive inventory of over 350 new, Certified Pre-Owned and preowned BMW models for sale, you're sure to find just what you're looking for. Our selection includes new BMW coupes, sedans, crossovers, SUVs and more with the most popular models like the 3 Series, 5 Series, the X1, X3, X5, 7 Series are always in stock. Whether you're looking to buy, lease or finance, you'll Experience the Ultimate Difference at BMW of Sarasota. That's because every vehicle we sell is always marked at our lowest price so you'll never have to wait to save. We even offer meticulously-inspected, budget-friendly preowned cars of all makes and models for even more savings. Remember, our experienced staff is here to help you find your next car in a no-pressure, relaxed environment so that you can make the best decision for your lifestyle and budget. If you already have a specific BMW model in mind, you can also schedule your test drive right now. We offer test drive scheduling online and by phone. You can also stop by BMW of Sarasota today! At BMW of Sarasota, luxury and performance are always within reach. Stop by our luxury Sarasota car dealership today and speak to one of our financial experts. They'll be happy to help you discuss all of your options. Want to know the specific terms of a BMW car lease you're interested in? We're here to help! How about the impact your credit score may have on your new BMW purchase? We can help there too! We can also help you find the best option for you before you start browsing our online inventory or even schedule online. Our Payment Estimator tool helps calculate your monthly payment or down payment so we can best formulate a plan to help you get behind the wheel without going over budget. Knowing whether you prefer If you prefer to buy a new or Certified Pre-Owned (CPO) BMW or a quality prreowned car will simplify your search and narrow down your financing options. You may just drive off with a great CPO 2006 BMW 3 Series or you may find out that you can comfortably afford the brand new 2018 BMW 3 Series! We have a variety of BMW finance deals for every budget. So take the stress out of your car shopping experience today by exploring all of your options today! At BMW of Sarasota, we're more than just your preferred luxury BMW car dealer, we're also your preferred luxury BMW service center. Count on us for everything from your BMW synthetic oil change service to emergency repairs and everything in between. Our state-of-the-art maintenance and repair center is managed by a team of BMW certified technicians that are ready to help you with everything you need. Whether it's an oil leak, replacement of your alloy wheels, a rip in your leather seats, or tire mounting and balancing, let our professional service department take care of your luxury vehicle and get you back on the road safely and efficiently. BMW of Sarasota also offers BMW service coupons so you can save on your next maintenance and repair including BMW motor oil service, brake fluid service, wiper blade replacement and more. Market-Exclusive CFNA Platinum Card To All Clients For Parts And Service Needs. Unmatched Communication Via Text, Email Or Phone To Keep You Informed About Your Vehicle. Largest Selection Of Online BMW Parts And Accessories On The West Coast Of Florida. Now that you've read about everything that BMW of Sarasota has to offer, it's time to visit us today and experience it for yourself. One visit is all it'll take to Experience The Ultimate Difference! Come see why more luxury and performance drivers are choosing BMW of Sarasota over the competition. We offer an extensive selection of new and Certified Pre-Owned BMW models, and preowned options at our best price. BMW of Sarasota also proudly serves drivers from Bradenton, Port Charlotte, Lakeland and the surrounding area.